A Philip Lowry brace and Daryl Fordyce’s first league goal of the season put the Blues in command at half time, and an Eamonn McAllister consolation goal sandwiched in between a double from his namesake Mark was not enough to spare Donegal Celtic’s blushes. The Blues were missing Rory Patterson who sustained a broken wrist in the 1-0 victory over Coleraine the previous weekend, while Aaron Burns dropped to the bench. In came Michael Carvill and Daryl Fordyce who both gave the home side a tough time all afternoon. The first goal was courtesy of a costly error from DC defender Darren McNamee who dallied on the ball inside the box following a communication mix-up with goalkeeper Robert Robinson, and Philip Lowry pounced to poke the ball past Robinson to give the visitors an early advantage. It was a superb first half performance by the champions, and Lowry doubled his tally after 25 minutes. It was his sixth goal of the season, and amazingly all six have come against Donegal Celtic – he found the net four times against them in the 5-0 victory back in August. 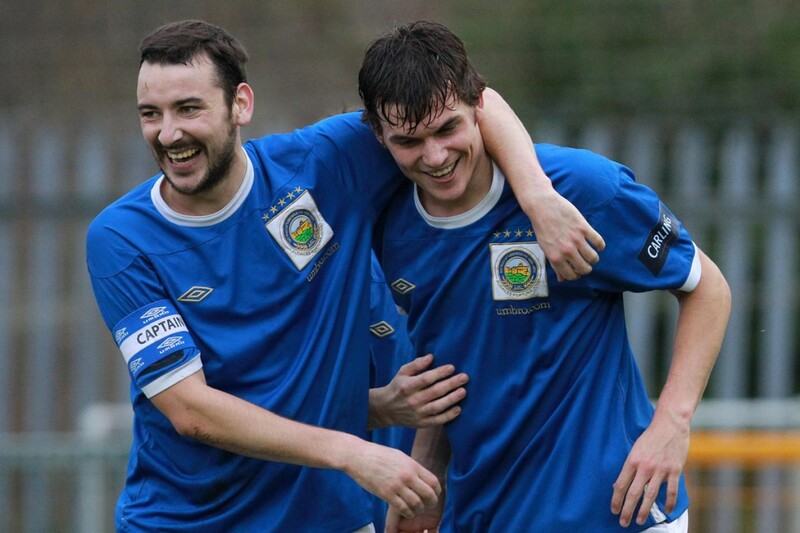 Linfield were rampant and added a third seven minutes later. Billy Joe Burns was the provider this time, his cross from the left found a leaping Fordyce whose powerful header found the back of the net and the match was effectively over. It was Fordyce’s first goal since his debut against BATE Borisov and it will doubtless be a massive relief for the ex-Portsmouth player. The second half started where the first left off. Robinson was once again called into action when he saved well from Carvill just after the hour mark. The Linfield forward once again caused havoc five minutes later; chasing down what looked like a lost cause, and not only keeping the ball in play but finding Lowry with a first-time cross, but the midfielder narrowly missed out on his hat-trick, as his effort rebounded away off the post. All the pressure eventually paid off on the 72nd minute when Mulgrew, who was influential all day, slipped Mark McAllister in behind the defence and his composed finish was his ninth goal of the season. The West Belfast side restored a degree of pride with ten minutes left on the clock, albeit fortuitously through Eamonn McAllister’s deflected shot. This brief resurgence was extinguished a mere three minutes later as McAllister grabbed his second of the game. Both Garrett and Watson had shots blocked inside the penalty area, but it was third time lucky when McAllister fired into the net to complete the rout. It rounded off a comprehensive victory for the Blues who avenged the 2-0 reverse score line here from last New Year’s Eve. So Linfield stay two points clear at the top of the Carling Premiership, and will look to continue their run of victories away to Carrick Rangers at Seaview on Saturday afternoon.